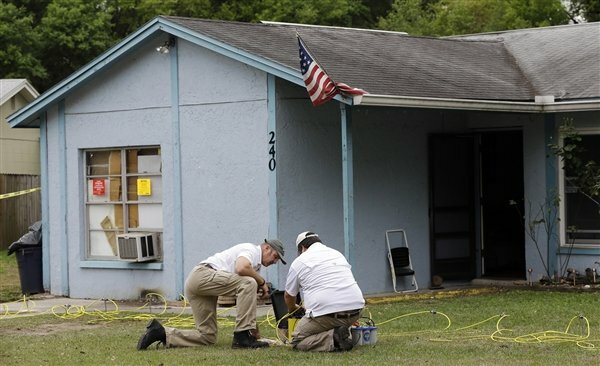 Rescue teams in Florida have called off their efforts to recover the body of Jeffrey Bush, the man who was swallowed by a huge sinkhole under his home. “At this point it’s really not possible to recover the body,” Hillsborough County Administrator Mike Merrill said. Early estimates put it at 20 ft (6 m) deep and 30 ft in diameter but officials have created a 100 ft-wide safety zone fearing the top of the sinkhole is growing. Jeffrey Bush’s tearful brother, Jeremy, lay flowers and a stuffed toy near the house on Saturday. Jeremy Bush was in the house on Thursday night and heard his brother scream as the concrete floor under the bedroom gave way. He rushed into his brother’s room and jumped into the hole to try to save him but had to be rescued himself by police. Jeremy Bush told reporters that someone had visited the four-bedroom house some weeks ago to check for sinkholes and other issues but found nothing wrong. “And a couple of months later, my brother dies. In a sinkhole,” he said.